Daloy Dance Company’s Artistic Director Ea Torrado confronts the inarticulable interior experience of grieving, incorporating elements of storytelling, naturalistic movements and dance in “Wailing Women,” before flying off as a Fellow for a 6-month Research Residency in New York City under the Asian Cultural Council (ACC). The ACC recently awarded similar grants to Filipino artists Leeroy New, Delphine Buencamino, and Glenn Mas in New York to further push their artistry in their work. This original dance theater piece embodies the different manifestations of coming to terms with loss – loss of a friend, an idea, a home, identity, a sense of self, to stories of ‘the crying ladies’ and the many wailing widows and mothers found in the crime scenes of the ongoing Philippine war on drugs. “Wailing Women” ponders and embodies unresolved pain and bereavement. 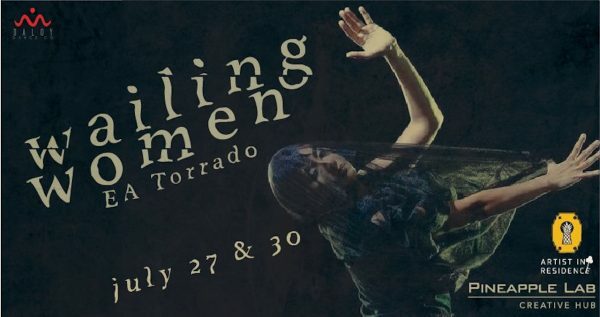 Directed and performed by Ea Torrado, “Wailing Women” is presented in cooperation with Daloy Dance Company and will premiere on July 27 & 30, 2017, 6PM at Pineapple Lab. This work will then fly off to The Goyang International Dance Festival in South Korea, Kultura Filipino Arts Festival in Toronto, Canada in August, and various performances in New York City through the Asian Cultural Council. Ea Torrado is a Filipina contemporary dancer, teacher and choreographer. She is the founder and artistic director of Manila-based dance theatre group, Daloy. Ea seeks to understand impositions of identity by investigating the Body as space, as shell, as suppository of our memories, and investigate the connections between personal experiences and larger social and political structures in the Philippines. Her full-length works Dots (2013), Nga-nga (2013), Dysmorphilia (2014) and Pieces of Me (2015), investigate notions of personal confinement and showed non-linear stories where the characters attempt to journey from disempowerment to liberation and/or despair. Filipinas (2014), Sisa (2014), Canton (2014) and Silenced (2016), has politically charged themes that explored Filipino identity and feminism. Wailing Women and Unearthing are a continuation of her investigation of the inner space or “loob” and its relationship with indignant narratives that are relevant to the healing of the Filipina. Ea will be in New York for a 6-month Research Residency as an Asian Cultural Council Fellow. She will focus on further exploring dance as a healing practice by structuring a curriculum for a new movement language called Daloy. Erratum: An earlier version of this article stated that the event starts at 8pm. We have since corrected it to 6pm.